This document describes requirements for the layout and presentation of text in languages that use the Arabic script when they are used by Web standards and technologies, such as HTML, CSS, Mobile Web, Digital Publications, and Unicode. This document describes the basic requirements for Arabic script layout and text support on the Web and in eBooks. These requirements provide information for Web technologies such as CSS, HTML and digital publications about how to support users of Arabic scripts. Currently the document focuses on Standard Arabic and Persian. To make it easier to track comments, please raise a separate issue for each comment, and at the start of the issue add a URL pointing to the section you are commenting on. The aim of this document is to describe the basic requirements for Arabic script layout and text support on the Web and in eBooks. These requirements provide information for Web technologies such as CSS, HTML and digital publications, and for application developers, about how to support users of Arabic scripts. The document focuses on Standard Arabic and Persian. This document is pointed to by a separate document, Arabic & Persian Gap Analysis, which describes gaps in support for Arabic and Persian on the Web, and prioritises and describes the impact of those gaps on the user. Wherever an unsupported feature is identified through the gap analysis process, the requirements for that feature need to be documented. This document is where those requirements are described. This document should contain no reference to a particular technology. For example, it should not say "CSS does/doesn't do such and such", and it should not describe how a technology, such as CSS, should implement the requirements. It is technology agnostic, so that it will be evergreen, and it simply describes how the script works. The gap analysis document is the appropriate place for all kinds of technology-specific information. The document International text layout and typography index (known informally as the text layout index) points to this document and others, and provides a central location for developers and implementers to find information related to various scripts. The W3C also maintains a tracking system that has links to github issues in W3C repositories. There are separate links for (a) requests from developers to the user community for information about how scripts/languages work, (b) issues raised against a spec, and (c) browser bugs. For example, you can find out what information developers are currently seeking, and the resulting list can also be filtered by script. This document is focused on two languages: Standard Arabic and Persian. Standard Arabic—a.k.a. Modern Standard Arabic or Literary Arabic—is the standardized and literary variety of Arabic used in writing and in most formal speech in countries of Northern Africa and West Asia. Regional and classical dialects of Arabic may differ in layout and text details and are not covered by this document. However, there are some major differences in common practices between the Western Arab regions—that is North-West Africa—and Eastern Arab regions—which is North-East Africa and West Asia. For example, the numeral digits used in the two regions and their formatting are vastly different. Although, there's no clear line between the Eastern and Western Arab regions. Persian—a.k.a. Modern Persian—is the standardized and literary variety of the official languages used in Iran and Afghanistan. The dialect of Persian in Iran is also called Western Persian, and is locally known as Farsi. The dialect of Persian in Afghanistan is also known as Eastern Persian, and is locally known as Dari. Tajik—a.k.a Tajiki or Tajiki Persian—is the Persian language as used in Tajikistan. It is written in the Cyrillic script, therefore, is not covered by this document. Arabic script is encoded in the Unicode standard semantically, meaning that every letter receives only a single Unicode character, no matter how many different contextual shapes it may exhibit. Unicode also has a partial set of non-semantic encoded characters for the Arabic script, under blocks Arabic Presentation Forms-A and Arabic Presentation Forms-B, which are deprecated and should not be used in general interchange. Appendix lists characters used for the Arabic and Persian languages. Characters used for these languages include letters and diacritics, three sets of digits (usage depending on the region), punctuation (some common and some specific to the script), symbols, and Unicode formatting characters. The majority of these characters are common among different languages. There are three different sets of digits used by different languages. Most of the alphabetical characters are used by all the languages using Arabic scripts, but there are exceptions, such as the Arabic letter yeh being represented with two different characters, U+064A ARABIC LETTER YEH (ي) and U+06CC ARABIC LETTER FARSI YEH (ی). These differences among the character sets of each language are marked in the appendix tables. Control characters are used to produce the correct spelling of the words or to ensure correct combination with left-to-right content. Consequently, they should be preserved when storing and displaying texts. Arabic script is written from right to left. Numbers, even Arabic numbers, are written from left to right, as is text in a script that is normally left-to-right. When the main script is Arabic, the layout and structure of pages and documents are also set from right to left. Unicode Bidirectional Algorithm (or bidi algorithm, for short) [[!BIDI]] details an algorithm for rendering right-to-left text and covers a myriad of situations in mixing different kinds of characters. A simpler explanation of the basics of the algorithm exists in the W3C article Unicode Bidirectional Algorithm basics. [[UBA-BASICS]] You can refer to these documents for more information about Unicode’s bidirectional algorithm. A brief overview of the bidirectional algorithm follows, because the direction is an essential part of how Arabic script is used. The characters of a text are digitally stored and transferred in the same order that they are typed by a user. This is the order in which the text is read and pronounced by people and held in memory by software applications, as shown in for a sample text. But the order used when displaying text is different. The purpose of the bidi algorithm is to find display positions for the characters of a text. These positions are solely used for displaying texts. shows the same sample text when prepared for display with the bidi algorithm. An initial step of the process involves determining each paragraph’s base direction: whether the paragraph is left-to-right or right-to-left. The base direction is either explicitly set by the author, inherited from the page, or (typically for user-generated content) detected based on the content of the paragraph. The base direction has two important uses later in the process. The next step is to split the text into directional runs. Each directional run is a sequence of characters with the same direction. Inside each run, all the characters follow the same order. The runs themselves are ordered for visual representation from left to right or from right to left, depending on the base direction of the paragraph. demonstrates an example of this. This is the first effect of the base direction. Unicode has a bidi class (or bidi type) property defined for each character that is used to determine the direction of each character. All the Arabic letters are marked as right-to-left characters, while Latin characters have the left-to-right category. Some characters, mostly punctuations, are neutral. The direction of these characters is derived from their surrounding characters. If a neutral character is surrounded by characters of the same direction (e.g. an space surrounded by Arabic letters), it gets the direction of its neighbors. Otherwise (e.g. a space between an Arabic and a Latin, or a neutral character appearing at the start or the end of a paragraph), the neutral character gets its direction from the paragraph’s base direction. This is another effect of the base direction in the bidi algorithm. The above explanation of the bidi algorithm is highly simplified, to convey only the essentials of how Arabic text is transformed for rendering. The actual algorithm deals with many more character types and edge cases. Please refer to Unicode Bidirectional Algorithm basics [[UBA-BASICS]] for more information or Unicode Bidirectional Algorithm [[!BIDI]] for the official detailed documentation. Arabic script is a cursive writing system; i.e, letters can join to their neighboring letters. Besides the core behavior of the script, there are some details on how content is encoded in Unicode, and some rules around joining behavior when rendering special cases. 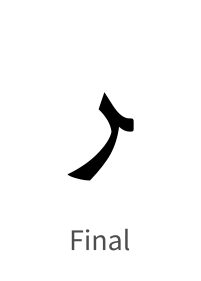 Final form, used when the letter is joined only to its previous (right-hand side) letter. shows samples of all four joining forms for U+0645 ARABIC LETTER MEEM (م). Join-to-left forms: either Initial form or Medial form of a letter, which joins to the left-hand side (next) letter. Other forms are called non-join-to-left. Join-to-right forms: either Medial form or Final form of a letter, which joins to the right-hand side (previous) letter. Other forms are called non-join-to-right. Dual-joining letters: can join from both sides, like the letter in , and has all the four shapes mentioned above. Right-joining letters: can only join to their previous (right-hand side) letter, and therefore, only have isolated and final shapes. shows samples of both forms for U+0631 ARABIC LETTER REH (ر). Non-joining letters: cannot join to any surrounding letter, and therefore can only take the isolated form. shows a sample of U+0621 ARABIC LETTER HAMZAH (ء) in its only possible form. Right-joining letters only have two forms of final and isolated. Most of Arabic letters are either dual-joining or right-joining. 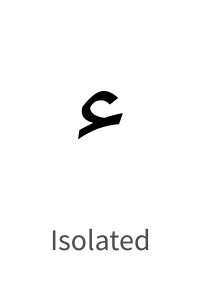 Non-Joining letters only have one form: isolated. Letters of each word join together whenever possible, implicitly. In some languages, like Persian and Urdu, there are words—mostly, but not limited to, compound words—that require explicit breaks in the joining of letters, although joining would otherwise be possible. In certain cases, a letter can be in a join-to-left form without actually connecting to anything on the left, whether there’s any letter or not. This is often seen in list counters, abbreviations, and other cases where letters do not have a word context, or are taken out of their original word context. In rare cases of words splitting where letters are joined, first letter of the second half will be in a join-to-right form without any previous letter. This behavior is limited to special cases like blanking specific letters of a word, line breaks in a paragraph, and word breaks across poetry verses. No standalone word can have any letters in join-to-right form without joining on the right-hand side. demonstrates how letters join (per Joining Rule 1) to form a word. Letters join by taking their relevant form. Arabic letters are represented in their intended joining forms in hand-writing, typewriters, and old (deprecated) digital encodings of the script. In Unicode, letters are encoded semantically—meaning without any information about their joining form—and therefore there’s need for a mechanism for controlling of the joining behavior of the letters. In Unicode, by default, neighbor Arabic letters join together if and only if both letters are able to join towards the other. As noted in Joining Rule 2, sometimes two Arabic letters sit next to each other (in one word) which would normally join together, but should not. In Unicode, for such a case, a special character should be used to enforce disjoining of these letters. This character is called U+200C ZERO WIDTH NON-JOINER, or ZWNJ for short. Example of using ZWNJ for disjoining enforcement. Similarly, as noted in Joining Rule 4, sometimes an Arabic letter needs to take a joining form when it would not happen normally. For example, some abbreviation methods use Initial Form of letters, when possible, for every letter in the abbreviation. Again, in Unicode, a special character should be used to enforce joining on this letter. This character is called U+200D ZERO WIDTH JOINER, or ZWJ for short. Besides ZWJ, there’s another special Unicode character, U+0640 ARABIC TATWEEL, which enforces joining behavior (join causing) on letters next to it. But, in contrast to ZWJ, TATWEEL has a glyph shape, looking like a hyphen and usually as wide as the SPACE glyph, which connects to the letters on the main joining line (a.k.a. base-line). So, using TATWEEL would give a similar Joining Enforcement behavior, but has a side effect of wider length for the letter, which is not always desired. That’s why it’s highly recommended to only use ZWJ for joining control. Example of using ZWJ (recommended) and TATWEEL (not recommended) for joining enforcement. 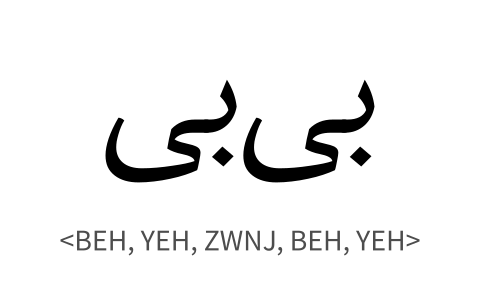 In Unicode, ZWNJ and ZWJ are called Joining Control Characters. Two enforcement methods mentioned above can be combined together to form a Joining-Disjoining Enforcement method, that enables Joining Rule 3 for cases when there’s a dual-joining/right-joining letter after a join-to-left letter, which should not be joined to its previous letter. Example of using <ZWJ, ZWNJ> for joining-disjoining enforcement. Joining Control is not only managed by the content, but sometimes happens by the word context. For example, a word may be broken between two joined letters because of line break, meaning the content is not changed and only the joining form of letters should be maintained across the break. A sequence of letters that join together are called a Joining Segment. Regardless of language, joining segments have no direct relationship to syllables. Two types of joining segments exist: closed and open. Joining Segments usually have a closed form, meaning that they start in a non-join-to-right form and end in a non-join-to-left form. Closed joining segments are the result of segments either start and end with their normal behavior (Joining Rule 1), or by disjoining enforcement (Joining Rule 2). Single-Letter Closed Segment, which contains only one letter that is in its Isolated form. 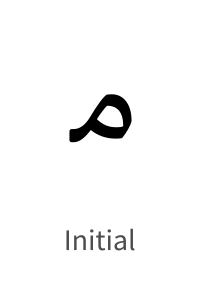 Multi-Letter Closed Segment, which contains more than one letter, starting with an Initial form, zero or more Medial forms, and ending with a Final form. 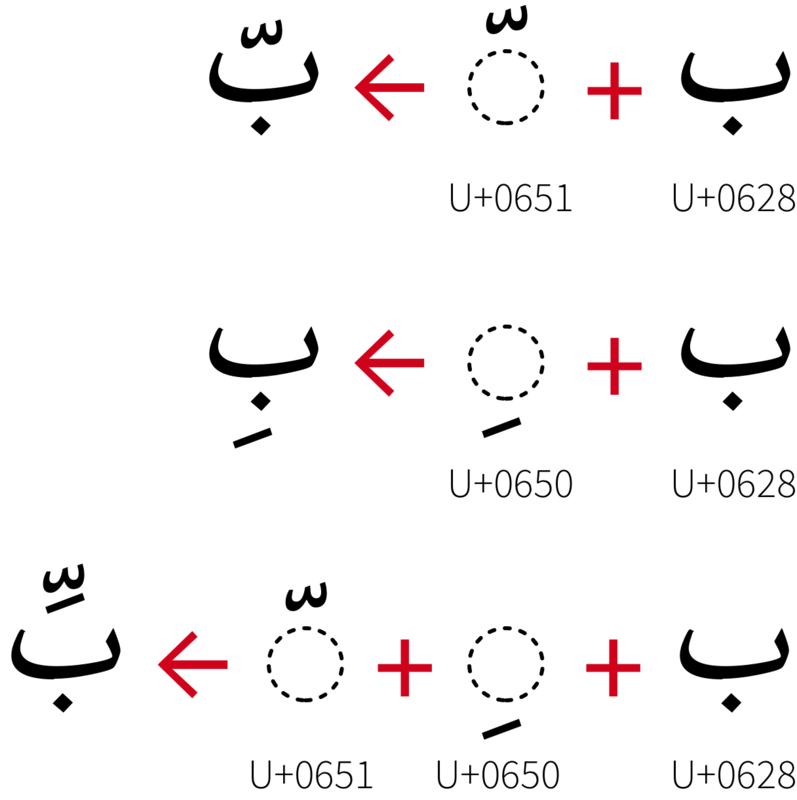 Examples of closed joining segment types. Under the certain cases, as noted in Joining Rules 3 and 4, joining segments can start with a join-to-right form, or end with a join-to-left form, or both. 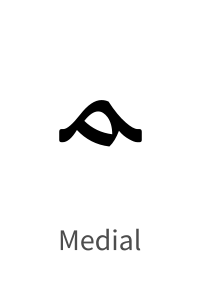 Open-On-Left Segment, which contains one or more Dual-Joining letters, starting with an Initial form and continuing with zero or more Medial forms. Open-On-Right Segment, which starts with zero or more Medial Form letters, and ends with a Final Form letter. Open-On-Both-Sides Segment, which contains one or more Dual-Joining letters, all in their Medial Form. Examples of joining segment types. 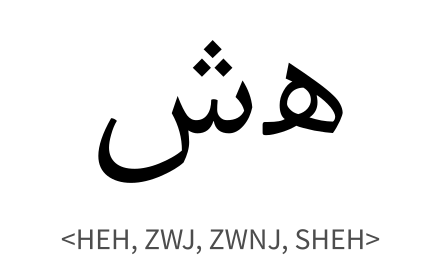 Arabic Letters, two Joining Control Characters (ZWNJ and ZWJ), and TATWEEL are the only characters used in the Arabic writing system with joining behavior. Arabic diacritics, other Unicode non-spacing marks, and most Unicode format control characters are considered transparent in joining behavior. All other Unicode characters in Arabic script (as well as Latin and many other major scripts) are non-joining and do not take any joining forms other than Isolated. Almost all the writing styles of Arabic script use a special shape when letters lam and alef are joined. Most Arabic fonts include mandatory ligatures for this combination. Ignoring this ligature, as shown in , leads to wrong rendering of text. This shape is not limited to the combination of U+0644 ARABIC LETTER LAM (ل) with U+0627 ARABIC LETTER ALEF (ا). Variations of letter alef such as U+0622 ARABIC LETTER ALEF WITH MADDA ABOVE (آ) and U+0623 ARABIC LETTER ALEF WITH HAMZA ABOVE (أ) and also variations of letter lam follow the same rules as well. Combination with diacritics does not affect these ligatures. Each of these ligatures also provides a special shape for joining from its right side (to the preceding letter). More than one diacritics can appear after a single character subsequently and all of them should be applied over the same character. Font files usually define special shapes or positioning for combination of diacritics. These extra information should be applied in rendering texts. shows an example, where, according to this font’s specification, combining U+0651 ARABIC SHADDA and U+0650 ARABIC KASRA changes their positions. Various font files may require different transformations. Diacritics could be combined in Arabic script. Arabic styling and writing has its origins in Islamic art and civilization, and was widely used to decorate mosques and palaces, as well as to create beautiful manuscripts and books, and especially to copy the Korʼan. Arabic script is cursive, making it viable to support different geometric shapes overlapping and composition. Words can be written in a very condensed form as well as stretched into elongated shapes, and the scribes and artists of Islam labored with passion to take advantage of all these possibilities. 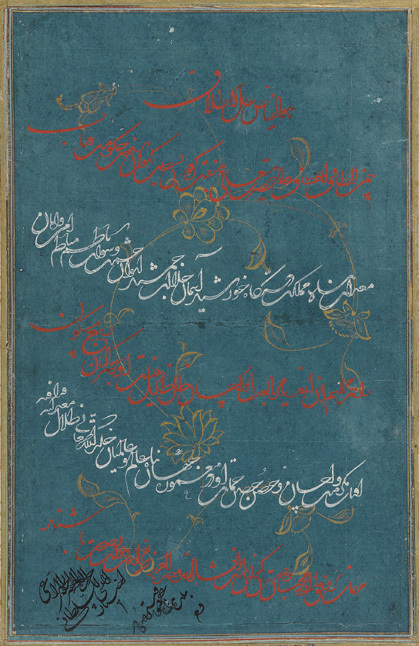 From the beginning of Arabic calligraphy, two tendencies or two types of styles can be seen emerging: writing for the decoration of mosques and sculptures, which was complex and highly decorative, and writing styles reserved for writing the Korʼan, which were easier to use and more readable. Writing styles then evolved under the influences of cultural diversity, leading to regional calligraphic schools and styles (Kufi in Iraq, Farsi and Taʻlīq in Persia, or Diwani in Turkey). Additional differences arose depending on the purpose of writing, such as the copying and dissemination of the Korʼan. In general we group under the generic term Naskh (copy/inscription) the scripts which are meant for reading at smaller sizes and are suitable for books and texts to be read, e.g. the Korʼan, and as Kufic the highly stylized font styles used for ornamentation and more styled writings. Nevertheless, the rich evolution of the Arabic script led to the distinctive enumeration of a number of additional named styles. Similarly, two other generic terms are used to classify styles : Mabsut (wa Mustaqīm) is a form of style that is elongated and straight angled, [which dominated the copies of Korʼan in eighth and ninth centuries], and Muqawwar (wa Mudawwar) is a form of style that is curved and rounded. 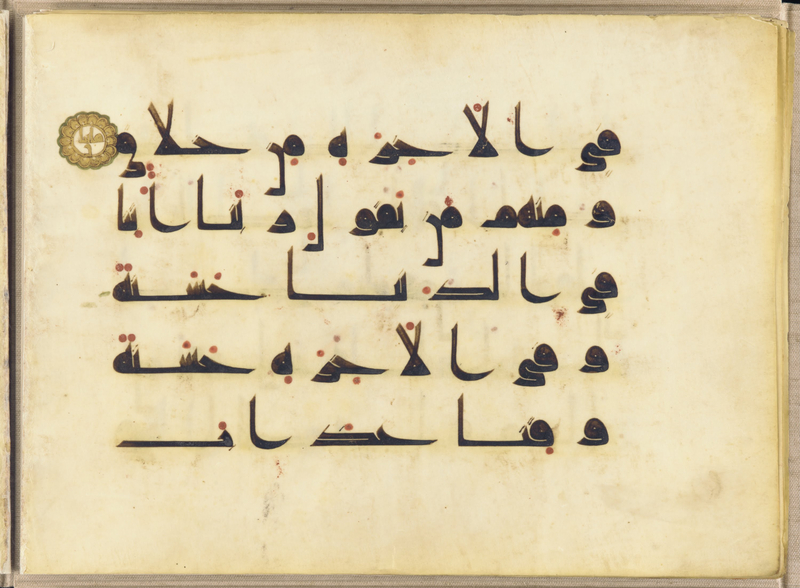 Basics and principles of Arabic writing were defined by Ibn Moqlah (886-940 Higra), who defined six styles of writing: Kufi, Thuluth, Naskh, Ruqʻa, Taʻlīq and Diwani. One of the oldest and best known Arabic scripts. It is characterized by its decorative and pronounced geometric forms, well adapted for architectural designs. The style grew with the beginning of Islam to satisfy a need for Muslims to codify the Korʼan. (The third.) Recognizable by the fact that the letters and words are highly interleaved in its complex form. May be the most difficult style to write (requiring a significant amount of skill), both in terms of its letters and in terms of its structure and composition. One of the clearest styles of all, with clearly distinguished letters which facilitate reading and pronunciation. Can be written at small sizes (traditionally using pens made of reeds and ink), which suits the production of longer texts used for boards and books intended for the general population, especially the Korʼan. A handwritten style still commonly used in Arabic countries, and recognisable by its bold-like letters written above the writing line. Designed to be used for education, for everyday writing and adopted in the offices (Diwan) of the Ottoman Empire. One of it's feature is that calligraphers have kept it and did not derived variations from it. Taʻlīq (hanging) is a beautiful script characterized by the precision and stretch of its letters, its clarity, and its lack of complexity. Designed for Persian language, until replaced by Nastaʻlīq. Used by the Ottoman court (Diwan) to write official documents. Some variations of it are still in use today (e.g. hand written documents by some religious officials). 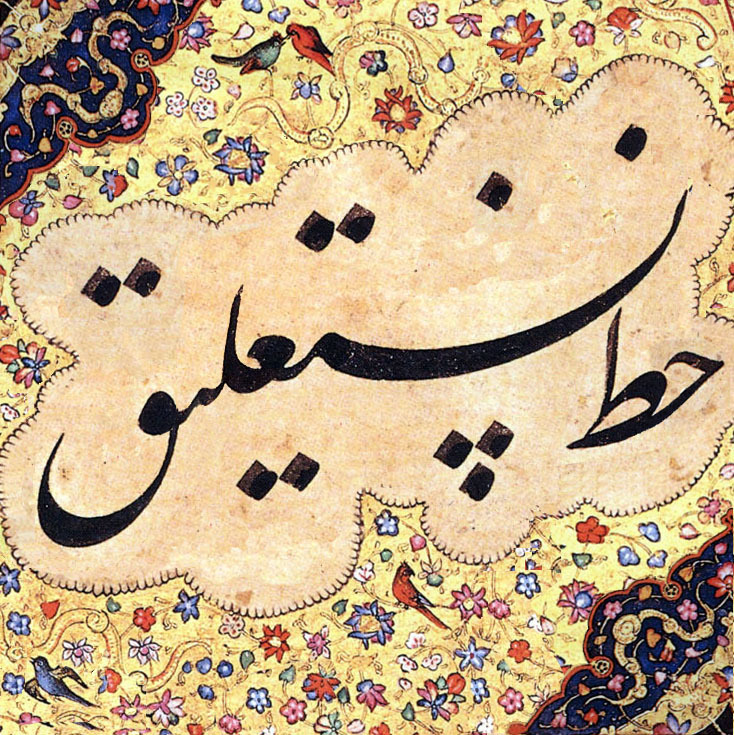 Persian version of Taʻlīq, derived from Naskh and Taʻlīq and developed in the 8th and 9th centuries. It is like a Taʻlīq but easier to write and read. Shekasteh Nastaʻlīq (literally means "broken Nastaʻlīq") is also another derivation of those two, developed in the 15th century. Used in the past in the western Islamic world (Andalusia), and still now in North Africa. Used for writing the Korʼan as well as other scientific, legal and religious manuscripts. 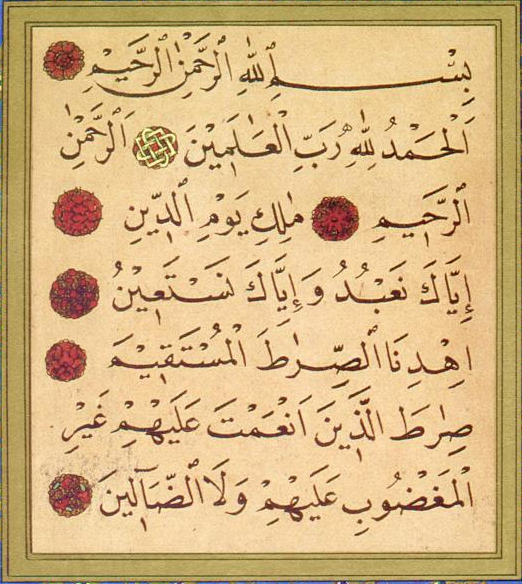 Rabat, a mabsut version of it, is widely used in some official printings in Morocco. Arabic script has some characteristics that are challenging for typographers and font designers. Examples bellow show some characteristics worth to be considered carefully. How could typography, which came late to the Arabic world, then follow the tradition of the many authors and artists who manually shaped the Arabic writing over decades? even in it's simplest Naskh style? Rendering of letters depends not only on their place in the word (initial, medial, final) but also on their neighboring letters, i.e. the letter they join with. Each letter has a different appearance in each combination. Initial letter noon, showing many different forms. Fonts don't always comply with or respect this kind of tuning. To do so, fonts need many glyphs in order to adapt to each context. In more modern typefaces some of these connections are implemented by ligatures, but ligatures can't capture or cover all joining behavior. In the two left most words, the initial noon differs in that one raises a kind of stroke. This property of raising a stroke is common for a number of letters (beh, teh, noon, theh) which are taller than their connected letters in order to be distinguished in some contexts, such as vs. , or to resolve ambiguity. See also the section about teeth letters below. A word shape is not (only) a "horizontal" connections of letters, but of groups of letters (syntagmes). 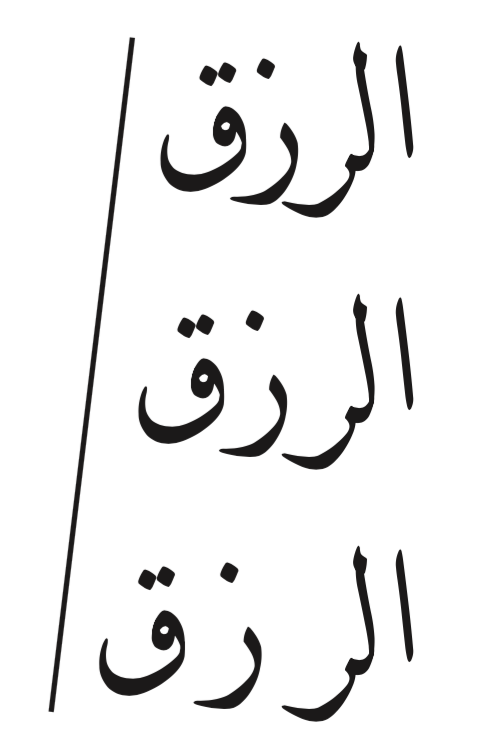 Example two words in some nice Naskh font. Can't really say letter groups. Rather a "horizontal sequence of letters of almost same width". Group combinations cannot be covered by general or usual ligatures. Groups of letters may also "join" vertically (top down) instead of right to left. And not all fonts permit this. Once again, some fonts try standard ligatures, but this is not ligature. This is rather (good) writing practice/style. One should note that all this characteristics has not only an aesthetic side, but also play a role in justification. It is at the discretion of (hand writing) authors to chose the best kind of joining to suit the desired line width. Should then be a general rule on that. But to achieve such justification would require sophisticated algorithms. The so called teeth letters. Letters having uniform medial shape, align in a kind of teeth. Even in the teeth context letter shape may vary. It's not the same letters (in red) which raise the stroke in the two figures. Arabic script counts 26 letters, and mostly 19 basic shapes. Since letters change according to their position in the word, Arabic set of glyph may range to more than one hundred shapes. If one count possible ligatures, and different combination of joining forms (see above), the number of glyph can increase further. Not sure that typeface design can accommodate all needs, even though some present typefaces can run hundred of shapes. Early typefaces, some still in use today, were designed with some facilities. Designer of those differs in their simplification hypothesis. For example, one of the first approach is to use "type writer style", that is a same glyph for different positions in a word. This is the case for initial and medial shape for most of the letters (example here). It is generally the browser default font for Arabic script. A more unifying approach is the use of a single and detached glyph for each letter without joining (todo example here). Other approach were used resulting in more or less visually practical fonts. Font style for titles and banners and alike (small number of words), may differ from the style for content text (long text). Some fonts might give another opportunity for line justification than the one based on word spacing (See section 4.2.4 Ligatures). Similar to alphabetic orthographical conventions of Latin script, word-boundaries in Arabic script can be distinguished by white space and a specific subset of punctuation marks. The earliest known example of an Arabic text typeset with movable types which dates back to 1514, lacks word-space boundaries and shows all characteristics of following the calligraphic tradition. Arabic books typeset by the end of the century show a progression towards using word-space boundaries and by the end of 18th century, the practice is widespread and common. the misuse of space in place of ZWNJ in some Arabic script languages. Unicode Text Segmentation [[!UAX29]] describes guidelines for determining most significant text boundaries independent of language and orthographic conventions. These guidelines shape a logical set of rules for default boundary determination based on Unicode Standard uniform character model. Beyond this default boundary determination model, the locale-specific boundary specifications, including cases which require boundary suppression, are available in [[!CLDR]]. For line segmentation (or more precisely, where line breaks are allowed) see section 4.1 and for details paragraph boundaries see Section 4.3. In Arabic script text it is unusual to use diacritics for vowel information and for consonant lengthening. If they are used, however, there are different approaches to their placement relative to the base characters they modify. Some fonts display short vowel diacritics at the same height, while others vary the height according to the base character. Another potential difference arises when a short i vowel diacritic is used with a shadda. In some cases the vowel diacritic remains below the base letter, whereas in other cases the vowel diacritic appears above the base letter, but under the shadda (so that it can be distinguished from the short a vowel diacritic, which appears above the shadda). In a heading, or a word on a street sign to make it more visible. Alongside a transcriptions, to make Arabic text the same width. These instances do not correspond to letter-spacing in non-cursive scripts, however. Apart from the fact that the stretching is indicated by stretching the baseline between characters, the stretching is not usually equidistant between all characters in the stretched text. The cursive nature of the Arabic script requires more attention when applying some visual styles to the texts. It mostly occurs when the implementation assumes letters as separated shapes and does not account for cursive scripts. The only spaces inside Arabic words are created near characters that are not dual-joining. When adjusting intra-word spaces (i.e. the space inside the words) only these spaces can be adjusted. Moving two joined characters closer to or further from each other creates undesirable results. Arabic fonts achieve joining by overlapping letters. A left-joining letter extends out of its bounding box from the left side and a right-joining letter extends out of its bounding box from the right side. Making each letter transparent can expose these overlapping joinings, which should be avoided. Joining the paths of the joined letter into a single shape can remove the overlappings and create the good results. Applying transparency to Arabic letters should not expose their joining overlaps. When adding text border, simply adding a border to each letter shape fails to produce the proper result for the Arabic script. A joined letter should not be separated from its joined neighbors by adding border. Like transparency, a way to avoid this is to unify glyph paths into a single big path for all the letters that are joined and add border around that path. Text border should not expose joinings. For educational, technical, or even aesthetic reasons, users might want to apply a specific style to a single letter (or a few letters) in a word. For example, is the logo of the largest telecommunications provider in Oman. 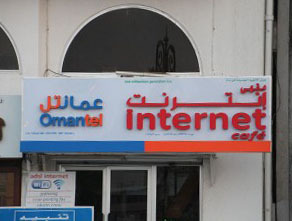 Colour changes across joining characters in the logo for Omantel. This should not break the letter’s joining with its neighbors, as shown in . Applying style to a single letter should not interfere with its joining properties. Arabic ascenders and descenders extend much further than those of the Latin script, and care must be taken to correctly align text in the different scripts when they appear together. Before entering this section in we need to introduce few preferred terminological conventions for disambiguation and simplicity. European Numerals are 0, 1, 2, 3, 4, 5, 6, 7, 8, 9. They are also referred to as Western Arabic Numerals or simply as Arabic Numerals. Although these are terminologically correct terms, to avoid confusions we will refrain from using these phrases to refer to these numerals. European Numerals or ASCII numerals are used instead. Arabic-Indic Numerals are ٠, ١, ٢, ٣, ٤, ٥, ٦, ٧, ٨, ٩. Eastern Arabic-Indic Numerals are ۰, ۱, ۲, ۳, ۴, ۵, ۶, ۷, ۸, ۹. Extended Arabic-Indic Numerals same as Eastern Arabic-Indic Numerals. Western Arabic Numerals, or Arabic Numerals same as European Numerals. Eastern Arabic Numerals is used to refer to both Arabic-Indic Numerals and Eastern Arabic-Indic Numerals. Should be avoided due to ambiguity. Indic Numerals should be avoided to refer to either of Arabic-Indic or Eastern Arabic-Indic numerals. Digit, Numeral digit, and Numeral are used as synonyms. There are three families of numerals used with languages using the Arabic Script: the European Numerals, the Arabic-Indic Numerals, and Eastern Arabic-Indic Numerals. The following table, based on a similar table in [[W3-ARAB-MATH]] exhibits these three families. Those three numerals which have different shapes between Arabic-Indic Numerals and Eastern Arabic-Indic Numerals are highlighted. U+0039 DIGIT NINE 0 1 2 3 4 5 6 7 8 9 Western Arabic-speaking countries; e.g. Algeria or Morocco. U+0669 ARABIC-INDIC DIGIT NINE ٠ ١ ٢ ٣ ٤ ٥ ٦ ٧ ٨ ٩ Eastern Arabic-speaking countries; e.g. Egypt, Saudi Arabia, Iraq. U+06F9 EXTENDED ARABIC-INDIC DIGIT NINE ۰ ۱ ۲ ۳ ۴ ۵ ۶ ۷ ۸ ۹ Iran and Afghanistan. In all Arabic numeral systems, numbers are written with the lowest significant digits to the right and the highest digits to the left (a.k.a. left to right), though Arabic script is written from right to left. An important fact to note here is the bidirectional category of these numbers. European digits and Eastern Arabic-Indic digits are of category EN (European Number). Arabic-Indic digits are of category AN (Arabic Number), differently from their counterpart just above. The difference in bidirectional category between Arabic-Indic digits and Eastern Arabic-Indic digits is due to the difference in the behavior desired in Arabic vs. Persian. Five is written ۵ in Iran and ٥ in Egypt. Five is written ۵ in Iran and 5 in Morocco. European numerals are used with "," (U+002C COMMA) and "." (U+002E FULL STOP) as decimal separator and thousands separator, respectively, or vice versa; depending on the region. Sometimes, U+2009 THIN SPACE or U+202F NARROW NO-BREAK SPACE may also be used as thousands separator. Numbers do not always appear alone, and may appear alongside other characters like financial symbols, fraction signs, decimal and/or thousands signs (excluding math expressions here). Also there are Arabic-specific signs such as ؉ [U+0609 ARABIC-INDIC PER MILLE SIGN] and ٪ [U+066A ARABIC PERCENT SIGN], as well as the Arabic decimal " ٫ " (U+66B) and thousands " ٬ " (U+066C) separators, mentioned earlier. These are mostly used with Arabic-Indic digits. Numerals can also come separated by or mixed with space or other signs. Example are phone numbers +12 34 56 78 89, cars licence plate like 123 د‎ 4, quantities 37.5°, ٥٠ كلم (50km) etc. Particular attention is needed here. Firstly, numbers have a weak directionality with regards to the Bidi algorithm. For example, alongside a number, certain otherwise neutral characters, such as negative/positive sign, currency or degree symbols, are likely to be treated as part of the number rather than a neutral. Secondly, the placement of the accompanying signs and symbols may depend on the region: generally Middle East (or anglophone) vs. Western (or francophone) regions. This is not to mention punctuation signs. The percent sign is placed on the left after the number (ie. ٪١٢ not *١٢٪), and without a space (*٪ ١٢). With European numbers, % [U+0025 PERCENT SIGN] is sometimes used, and can be placed either on the right or the left of the digits (eg. 12% or %12). Arabic decimal and thousand separators obey the same rule as for European numbers (١٬٢٣٤٫٥٦). European signs are used with European numbers (1.234,56 or 1,234.56). Money or currency signs when they come alongside a number, are placed at the left and treated as part of the number rather than a neutral (€12.3 or €١٢٫٣). On the other hand, degree signs are placed at the right of the number (37.5° C, ٩٩٫٥° F) or (37.5° م, ۹۹٫۵° ف). When indicating quantity, there should a separating space (12 كغ, ٤٥ مم). The same rule applies when using range of values. (12-15 كغ, but 12٪-15٪ كغ). / [U+002F SOLIDUS] is used for fractions or ratio notation. Fractions are noted for one-half, say, 2/1 or ٢/١, mostly in RTL mode. There is no standard approach, however, and some region/author may write 1/2 for European digits. Notation such as speed "50 km/h"
When Arabic text doesn't fit within the available line width, the text is wrapped to the next line between words. In bidirectional text, if a line break occurs between a sequence of words that are progressing in a left-to-right direction the first line will be filled with LTR words that come at the start of the phrase in the order spoken (ie. not the visual order when laid out in a single line). This is because it is never correct to read lines from bottom to top. A similar rearrangement is required when a sequence of right-to-left words is split at the end of a line in an overall LTR context. There are a number of different ways to produce justified text in Arabic. In some cases several of these methods may be combined. In other cases, certain methods are disallowed. Expansion or contraction of inter-word spaces. Expansion or contraction of intra-word spaces, ie. the space following a character in the middle of a word that doesn't join with the character that follows it. Use of wider glyph forms for certain characters. Stretching of the joins between characters, known as 'kashida'. Use of ligated forms, to reduce space taken by characters on a line. Of the four basic justification methods (flush left, flush right, justified, and centered), justified is the most challenging, as it requires changing the widths of the lines to a pre-defined measure. Measure refers to the width of a column of text. In a justified paragraph the width of all the lines should be the same as the paragraph’s measure (except, of course, the last line). In Arabic there are six mechanisms for changing the width of a line of text. Each one has its limitations and considerations on when and how it can be applied. Furthermore, different typographers and calligraphers have divergent preferences for these mechanisms. An important factor in the application of these mechanisms is their success in creating an even color. The color of the text refers to the amount of ink (or blackness) used to print or show a block of text. Color describes the density of the text against its background. Poorly justifying paragraphs can create uneven distribution of color. These mechanisms are not exclusive. Quite the contrary, they are commonly used simultaneously to produce better justified paragraphs. Combination of these mechanisms is discussed in Combination of the Mechanisms. This is the same mechanism widely used when justifying Latin scripts, where the width of the spaces between the words can be increased or decreased to change the width of the line. Aligning lines by increasing and decreasing spaces between the words. A minimum width is defined for how much the space can be shrunk, because putting the words too close to each other creates aesthetic and legibility problems. Stretching the space too wide is also undesirable, but is utilized as a last resort when it is not possible to use other solutions to make fully justified paragraphs. In some applications a maximum width for the inter-word space is defined as a soft limit (compared to minimum width which is a hard limit). Reaching the maximum width makes the software to try to use other solutions for justification. If no other solution could yield the required result, the software would fall back to inter-word spacing and stretch the space past the maximum width. Depending solely on this mechanism for aligning lines in a justified paragraph can lead to unpleasant results, such as rivers (multiple stretched spaces appearing vertically close to each other and forming a white gap inside the paragraph) and uneven distribution of color in the paragraph. Hence, typographers generally use other mechanisms as well to minimize the effect of adjusting inter-word spaces. This solution alters the space between letters of each word to change the width of the text. Like adjusting inter-word spaces, this is used for Latin scripts as well, but using it for Arabic script involves considerations specific to Arabic. As noted in Joining and Intra-Word Spaces, the principal consideration is that gaps between characters only exist for those letters that join only to the right, such as dal and reh . Adjustment of intra-word space is not relevant where one letter is joined to its neighbors. Altering intra-word spaces between unjoined letters. Depending on the writing style and the typeface in use, different amounts of alteration to the intra-word space is acceptable for Arabic. Some writing styles allow more liberal adjustments to the closeness of the letter groups, while others can only accept small adjustments in this regard. In any case, much smaller adjustments can be used for intra-word spacing in comparison for inter-word spacing, which naturally is wider and tolerate bigger adjustments. In addition to the four joining forms (isolated, initial, medial, and final), each Arabic letter can come with different shapes while preserving its joining form. For instance, a typeface or writing style can offer two or more shapes for the final form of a single letter. These variant shapes usually have variant widths and hence can be used to adjust the width of the line. Alternative shapes for changing the width of the text. An advantage of using alternative letter shapes when justifying paragraphs is that it does not involve modifying default properties of the typeface (width of space or other characters). Instead, it is using shapes that are part of the typeface and are in harmony with other shapes in the lines. But excessive use of alternative shapes, such as using multiple very wide alternatives close to each other, can create unnatural results. It is not possible to justify paragraphs using only alternative letter shapes, because these shapes have predefined widths. For example, if a line should get 25 points wider, it is impossible to achieve that by using alternative letter shapes that are, say, 10 or 20 or 30 points wider than the default shapes. But these shapes can make the lines closer to measure, thus reducing the usage of other mechanisms. Some Arabic fonts, following the writing styles that use special shapes when joining certain letters, provide a rich number of ligatures. These ligatures can be used in paragraph justification, since they usually reduce the widths of the words. But existence of the ligatures in a font does not mean that they can be used freely. A font may provide some of its ligatures for creating an artistic style, which would be unsuitable for texts requiring optimum legibility. For that reason, the user should be able to select which sets of ligatures can be used for justification. Fonts can offer predefined sets of ligatures to simplify this process. Kashida refers to extending the horizontal connection between joined letters. Two words extended with kashida. This is a feature deeply related with the cursive nature of Arabic script. Kashida is an interesting tool for paragraph justification. It is more flexible than alternative letter shapes and ligatures, because it is not restricted to a limited number of predefined widths. At the same time, it has relatively less effect on the text color than spacing. But a proper implementation of kashida involves a number of limitations and considerations. Excessive use of kashida or applying very long kashidas results in uneven color. Also, horizontal or vertical proximity of numerous kashida creates an unnatural color. Unpleasant result of excessive use of kashida. Kashida is not always straight. Some fonts may require curvilinear kashidas, which require more advanced implementations. Typographers can have preferred places for applying kashidas. In other words, instead of applying kashida between every joined pair of letters, they want it at certain joins. There are multiple joins in this word, but only one is selected for kashida. Another preference is avoiding multiple kashidas in a single word. Tatweel is a dual-joining character that can be inserted between two joined letters to widen their connection. In The Unicode Standard, tatweel is represented as U+0640 ARABIC TATWEEL (ـ). Tatweel extends letter connections in a fashion similar to kashida, but in a much more limited way. It is a character that has to be in the text or inserted like other characters. It has a predefined width, like any other character. Yet it is much simpler to implement, since it acts like normal Arabic characters and does not require special treatment. For this reason, it can be considered useful specially in constrained implementations like fixed-width environments. Each of the above six mechanisms have their own limitations and side effects. Utilizing only one of them for justifying paragraphs can create undesirable results. Multiple mechanisms can be used at the same time to work around their limitations and minimize their side effects. Since Arabic provides various mechanisms that can be used for justification, an advanced implementation that supports all or most of the above features can produce exemplary justifications. More limited applications can combine what is available. Preferences for each mechanisms can depend on the document and text and the preference of the typographers and users. Implementations can enable users to prioritize and control the mechanisms mentioned above. Lines of Arabic script text are normally right aligned within the page. Arabic script text may use special counter styles for lists, numbering headings, pages, etc., based on Arabic script characters. In situations where short runs of text run vertically, for example on book spines or in table headers, Arabic text is rotated to run along the line. It may be rotated so that the tops of the letters face to the left (read the text from top to bottom) or to the right (read the text from bottom to top). The flow of text, top-down vs. bottom-up, may depend on regions or authors. The left case in is a typically francophone style for book spines, whereas the right case is an anglophone style. When Arabic is embedded in body text that is set vertically, such as CJK or Mongolian text, it is also normally rotated so as to run along the line. Typically, the Arabic text will be read from bottom to top of the line. When the Arabic text spans more than one line, the text is wrapped in the same way as it would be in horizontal text, ie. the first part of the Arabic text is kept on the first line, and subsequent parts of the Arabic text appear on subsequent lines. Therefore, in the case of Mongolian, where lines are read left-to-right, the Arabic text lines are also read left-to-right, whereas in Chinese or Japanese, where vertical lines are normally read right-to-left, the Arabic text lines are also read right-to-left. Arabic text embedded in vertical Chinese. 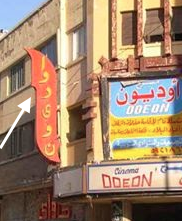 There are attested cases of Arabic text arranged vertically with the letters upright, for example in signboards for cinemas or theatres. It is not clear, at this point whether this a standard approach for Arabic text, or just an unusual layout that mimics Western typographic approaches. Arabic upright on a front movie (see arrow). The following should be noted in . Letters flow from top to bottom (as with Latin script). Isolated form of letters seems more appropriate here than the joined form. Diacritic marks, if any, must be applied to letters and not appear on separate lines. ✓ means that the character is used for that language. ✲ means that the character is auxiliary for that language. ✕ means that the character is not used for that language. Unicode 6.3 introduced directional isolate characters to replace the more complicated directional embedding characters. These new characters are in the process of being supported in applications and their usage is encouraged over the old embedding characters. U+202A LEFT-TO-RIGHT EMBEDDING, U+202B RIGHT-TO-LEFT EMBEDDING, U+202C POP DIRECTIONAL FORMATTING, U+202D LEFT-TO-RIGHT OVERRIDE, U+202E RIGHT-TO-LEFT OVERRIDE are the old embedding characters and U+2066 LEFT‑TO‑RIGHT ISOLATE, U+2067 RIGHT‑TO‑LEFT ISOLATE, U+2068 FIRST STRONG ISOLATE, and U+2069 POP DIRECTIONAL ISOLATE are the new isolate characters. Also, character U+FEFF ZERO WIDTH NO-BREAK SPACE is deprecated and should be replaced with U+2060 WORD JOINER. arabic numerals أَرْقَامْ عَرَبِيَّة، أَرْقَامْ أُورُوبِيَّة arqām ʻarabīyah, arqām ūrūbīyah ارقام عربی ārqām arbi Refer to "European numerals". Use "European numerals" or "ASCII numerals" to avoid confusion. back matter بَيَانَاتْ نِهَايَةْ الكِتَابْ bayānāt nihāyat al-kitāb واحدهای پس از متن uāhdhāy ps aoez mtn Appendices, supplements, glossary of terms, index and/or bibliography, and so on, appended at the end of a book. baseline خَطْ قَاعِدِي، خَطْ الاِرْتِكَازْ، سَطْرُ الأَسَاسْ khaṭ qāʻidī, khaṭ al-irtikāz, satru al-’asās خط کرسی xt krsi A virtual line on which almost all glyphs in Western fonts are designed to be aligned. bibliography المَرَاجِعْ al-marājiʻ کتابنامه ktābnāmh A list of works and papers related to the subjects in the text. blank page صَفْحَة فَارِغَة ṣafḥah fārighah صفحهٔ خالی sfhhٔ xāli An empty page. bleed خَارِجْ إِطَارْ الصَّفْحَة khārij iṭār al-ṣafḥah تصویرْ تا بُرِش tsuyrْ tā boreš To print a picture or a tint to run off the edge of a trimmed page. block direction اِتِّجَاهْ المَقْطَعْ، اِتِّجَاهْ الكُتْلَة ittijāh al-maqṭaʻ, ittijāh al-kutlah جهت نوشتار jht nuštār The progression direction of lines, one after the other. bold غَلِيظْ ghalīẓ حرف سیاه hrf siāh A kind of font style. Similar to bold in Western typography. bound on the left-hand side مُلْزِمَة عَلَى الجَانِبْ الأَيْسَرْ mulzimah ʻalá al-jānib al-’aysar صحافی چپ‌به‌راست shāfi čpbhrāst Binding of a book to be opened from the left. bound on the right-hand side مُلْزِمَة عَلَى الجَانِبْ الأَيْمَنْ mulzimah ʻalá al-jānib al-’ayman صحافی راست‌به‌چپ shāfi rāstbhčp Binding of a book to be opened from the right. break (a line) فَصْلْ السَّطْرْ، قَطْعْ (سَطْرْ) faṣl al-saṭr, qaṭʻ (saṭr) شکستن (خط)، سطرشکنی škstn (xt), strškni To place the first of two adjacent characters at the end of a line and the second at the head of a new line. broadside وَرَقَة عَلَى صَفْحَة عَرِيضَة waraqah ʻalá ṣafḥah ʻarīḍah یک‌رو ikru In book typography, a sheet of paper printed as one page. caption تَسْمِيَة، عُنْوَانْ tasmīah, ʻunwān عنوان، شرح ’nuān, šrh A title or a short description accompanying a picture, an illustration, or a table. cell خَلِيَة khalīah سلول slul Each element area of tables, cell. cell contents مُحْتَوَى الخَلِيَة muḥtawá al-khalīah محتوای سلول mhtuāy slul The content of each cell in tables. cell padding حَشْوْ الخَلِيَة ḥashw al-khalīah Spaces between line and cell in tables. centering تَوْسِيطْ tawsīṭ وسط‌چین کردن ustčin krdn To align the center of a run of text that is shorter than a given line length to the center of a line. character frame إِطَارْ الحَرْفْ iṭār al-ḥarf Rectangular area occupied by a character when it is set solid. character shape شَكْلُ الحَرْفْ shaklu al-ḥarf شکل حرف škl hrf Incarnation of a character by handwriting, printing or rendering to a computer screen. character size حَجْمُ الحَرْفْ ḥajmu al-ḥarf اندازهٔ حرف āndāzhٔ hrf Dimensions of a character. Unless otherwise noted, it refers to the size of a character frame in the block direction. color لَوْنْ lawn Char­ac­ter­is­tics like dark­ness, con­trast, texture that give the an overall impression of how dense or heavy the text appears on the page. column عَمُودْ ʻamūd ستون stun A partition on a page in multi-column format. column gap تَبَاعُدْ الأَعْمِدَة tabāʻud al-’aʻmidah فاصلهٔ ستون fāslhٔ stun Amount of space between columns on a page. column spanning عَبْرُ الأَعْمدَة ʻabr al-’aʻmidah A setting style of illustrations, tables, etc., over hanging to multiple columns. column spanning heading رَأْسْ عَبْرْ الأَعْمدَة ra’s ʻabr al-’aʻmidah Headings using multiple columns. composition تَرْكِيبْ tarkīb حروفچینی و صفحه‌بندی hrufčini v sfhhbndi Process of arrangement of text, figures and/or pictures, etc on a page in a desired layout (design) in preparation for printing. continuous pagination تَرْقِيمْ الصَّفَحَاتْ المُسْتَمِرْ tarqīm al-ṣṣafaḥāt al-mustamir صفحه‌شماری پیوسته sfhhšmāri pivsth a) To number the pages of a book continuously across all those in the front matter, the text and the back matter. b) To number the pages continuously across those of all books, such as a series published in separate volumes. Also to number the pages continuously across those of all issues of a periodical published in a year, aside from pagination per issue. cut-in heading A style of headings. Headings do not occupy the full lines, but share lines area with following main text lines. 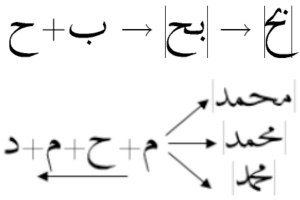 descender line مَا تَحْتَ السَّطْرْ mā taḥta al-ssaṭr A descender is the part of a letter extending below the base line, as in 'g', 'j', 'p', 'q', or 'y'. A descender line is a virtual line drawn at the bottom of descender parallel to base line. discretionary hyphen وَاصِلَة لَيِّنَة wāṣilah layyinah See soft hyphen. dpi نُقْطَة فِي البُوصَة nuqṭah fī al-būṣah نقطه در اینچ nqte dr ieynč Dots per inch (DPI, or dpi) is a measure of spatial printing. EM (وَحَدَةْ قِيَاسْ) إِمْ، وَحَدَةْ قِيَاسْ النُقْطَة (waḥadah qīās) im, waḥadat qīās al-nuqṭah اِم، ضربه āem, zrbh Unit in the field of typography, equal to the currently specified point size. A reference to the width of the capital "M"
EN نصف وحدة قياس النقطة niṣf waḥadat qīās al-nuqṭah اِن āen ??? endnote التَّعْلِيقْ الخِتَامِي، حَاشِيَة al-ttaʻlīq al-khitāmī, ḥāshīah A set of notes placed at the end of a part, chapter, section, paragraph and so on, or at the end of a book. European numerals أَرْقَامْ أُورُوبِيَّة arqām ūrūbīyah ارقام اروپایی ārqām aoerupāiy Any of the symbols in [0-9] used to represent numbers. Sometimes called Arabic numerals or ASCII numerals. fixed-width ثَابِتْ العَرْضْ thābit al-ʻarḍ A characteristic of a font where the same character advance is assigned for all glyphs. font الخَطْ al-khaṭ فونت، قلم funt, qlm A set of character glyphs of a given typeface. footnote حَاشِيَة سَفْلِيَة ḥāshīah saflīyah پانویس pānuys A note in a smaller face than that of main text, placed at the bottom of a page. fore-edge الحَافة العَمودِيَّة الخَارِجِيَّة al-ḥāfh al-ʻamwdīyah al-khārijīyah حاشیهٔ بیرونی hāšihٔ biruni a) The three front trimmed edges of pages in a book. b) The opposite sides of the gutter in a book. front matter المَادَّة الأَمَامِيَّة al-māddah al-’amāmīyah واحدهای پیش از متن uāhdhāy piš aoez mtn The first part of a book followed by the text, usually consisting of a forward, preface, table of contents, list of illustrations, acknowledgement and so on. full-width تَامْ العَرْضْ tām al-ʻarḍ a) Relative index for the length which is equal to a given character size. b) Character frame which character advance is equal to the amount referred to as a). A full-width character frame is square in shape by definition. gutter حَاشِیَة ḥāshīah حاشیه hāših a) The binding side of a spread of a book. b) the margin between the binding edge of a book and the hanmen (text area). c) The part of a book where all pages are bound together to the book spine. half em نِصْفْ اِمْ niṣf im نیم اِم nim em Half of the full-width size. half em space فَرَاغْ نِصْفْ اِمْ farāgh niṣf im فاصلهٔ نیم اِم fāslhٔ nim em Amount of space that is half size of em space. harakat حَرَكَاتْ ḥarakāt Tashkil marks representing short vowel sounds. heading عُنْوَانْ ʻunwān عنوان ’nuān a) A title of a paper or an article. b) A title for each section of a book, paper or article. headnote تَقْدِمَة taqdimah A kind of notes in vertical writing style, head area in kihon-hanmen is kept beforehand, and notes are set with smaller size font than main text. horizontal writing mode صِيغَة الكِتَابَة الأُفُقِيَّة ṣīghat al-kitābah al-’ufuqīyah حالت نوشتار افقی hālt nuštār aoefqi The process or the result of arranging characters on a line from left to right, of lines on a page from top to bottom, and/or of columns on a page from left to right. hyphenation اِسْتِخْدَامْ الوَاصِلَة istikhdām al-wāṣilah A method of breaking a line by dividing a Western word at the end of a line and adding a hyphen at the end of the first half of the syllable. ijam إِعْجَامْ iʻjām Diacritical marks applied to a basic letter shape (or skeleton) to derive a new letter. For example a dot under a "curve" to get the letter Beh. In Unicode each letter plus ijam combination is encoded as a separate, atomic character. illustrations رَسْمْ تَوْضِيحِي، صُورَة إِيضَاحِيَّة rasm tawḍīḥī, ṣūrahīḍāḥīyah تصویر tsuyr A general term referring to a diagram, chart, cut, figure, picture and the like, to be used for printed materials. independent pagination تَرْقِيمْ الصَّفَحَاتْ مُسْتَقِلْ tarqīm al-ṣṣafaḥāt mustaqil صفحه‌بندی مستقل sfhhbndi mstql To number the pages of the front matter, the text and the back matter independently. index فِهْرِسْ fihris فهرست راهنما fhrst rāhnmā A list of terms or subjects with page numbers for where they are referred to in a single or multiple volumes of a book. inline direction الاِتِّجَاهْ السَّطْرِي al-ittijāh al-ssaṭrī Text direction in a line. inseparable characters rule قَاعِدَة مَحَارِفْ لَا تَنْفَصِلْ qāʻidat maḥārif lā tanfaṣil A line adjustment rule that prohibits inserting any space between specific combinations of characters. itemization وَضْعْ بُنُودْ، تَبْوِيبْ، عَنَاصِرْ waḍʻ bunūd, tabwīb, ʻanāṣir To list ordered or unordered items one under the other. label name اِسْمْ بِطَاقَةْ العَنْوَنَة ism biṭāqat al-ʻanwanah Text following or followed by numbers for illustrations, tables, headings and running headings. 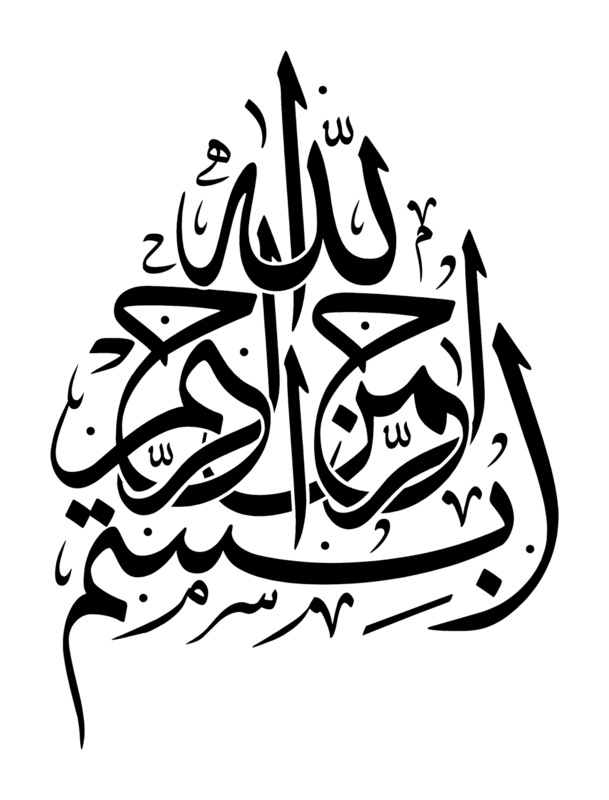 letter face صُورَةْ الحَرْفْ ṣūrat al-ḥarf Area in which glyph is drawn. letterpress printing طِبَاعَةْ الحُرُوفْ ṭibāʻat al-ḥurūf چاپ برجسته čāp brjsth The traditional printing method using movable type. line adjustment مُحَاذَاةْ السَّطْرْ muḥādhāt al-ssaṭr تنظیم خط tnzim xt A method of aligning both edges of all lines to be the same given length by removing or adding adjustable spaces. line adjustment by hanging punctuation مُحَاذَاة السَّطْرْ بِتَعْلِيقْ عَلَامَاتْ التَّرْقِيمْ muḥādhāt al-ssaṭr bitaʻlīq ʻalāmāt al-ttarqīm A line breaking rule to avoid commas or full stops at a line head (which is prohibited in Japanese typography) by taking them back to the end of the previous line beyond the specified line length. line adjustment by inter-character space expansion مُحَاذَاة السَّطْرْ بِتَوسِيع الفَرَاغْ بَيْنَ المَحَارِفْ muḥādhāt al-ssaṭr bitawsīʻ al-farāgh bayna al-maḥārif A line breaking rule that aligns both edges of a line by expanding inter-character spaces. .
line breaking rules قَوَاعِد كَسْرْ السَّطْرْ qawāʻid kasr al-ssaṭr A set of rules to avoid prohibited layout in Japanese typography, such as "line-start prohibition rule", "line-end prohibition rule", inseparable or unbreakable character sequences and so on. line end نِهَايَة السَّطْرْ nihāyat al-ssaṭr انتهای خط ānthāy xt The position at which a line ends. line end alignment مُحَاذَاة نِهَايَة السَّطْرْ muḥādhāt nihāyat al-ssaṭr هم‌ترازی انتهای خط hmtrāzi aoenthāy xt To align a run of text to the line end. line end indent مَسَافَة بَدْئْ نِهَايَة السَّطْرْ masāfat bad’ nihāyat al-ssaṭr تورفتگی انتهای خط turftɡi aoenthāy xt To reserve a certain amount of space before the default position of a line end. line feed تَغْذِيَة السَّطْرْ taghdhīat al-ssaṭr The distance between two adjacent lines measured by their reference points. line gap فَجْوَة السَّطْرْ fajwat al-ssaṭr فاصلهٔ بین خطوط fāslhٔ bin xtut The smallest amount of space between adjacent lines. line head رَأْسْ السَّطْرْ ra’s al-ssaṭr سرِ سطر sre str The position at which a line starts. line head alignment مُحَاذَاة رَأْسْ السَّطْرْ muḥādhāt ra’s al-ssaṭr هم‌ترازیِ سر سطر hmtrāzie sr str To align a run of text to the line head. line head indent مَسَافَة بَدْئْ رَأْسْ السَّطْرْ masāfat bad’ ra’s al-ssaṭr فاصلهٔ سر سطر، تو رفتگی سر سطر fāslhٔ sr str, tu rftɡi sr str To reserve a certain amount of space after the default position of a line head. line length طُولُ السَطْرْ ṭūlu al-saṭr طول خط tul xt Length of a line with a pre-defined number of characters. When the line is indented at the line head or the line end, it is length of the line from the specified amount of line head indent to the specified amount of line end indent. line-end prohibition rule قَاعِدَة حَظْرْ نِهَايَة السَّطْرْ qāʻidat ḥaẓr nihāyat al-ssaṭr A line breaking rule that prohibits specific characters at a line end. line-start prohibition rule قَاعِدَة حَظْرْ بِدَايَة السَّطْرْ qāʻidat ḥaẓr bidāyat al-ssaṭr A line breaking rule that prohibits specific characters at a line head. mabsut مَبْسُوطْ mabsūṭ Kind of writing style that tends to rigidity and firmness with pronounced angularity. main text نَصْ رَئِيسِي naṣ ra’īsī متن اصلی mtn aoesli a) The principal part of a book, usually preceded by the front matter, followed by the back matter. b) The principal part of an article excluding figures, tables, heading, notes, leads and so on. c) The content of a page excluding running heads and page numbers. d) The net contents of a book excluding covers, end papers, insets and so on. mixed text composition تَرْكِيبَة النَّصْ المُخْتَلِطْ tarkībah al-nnaṣ al-mukhtaliṭ a) To interleave Japanese text with Western text in a line (Japanese and Western mixed text composition). b) To compose text with different sizes of characters (mixed size composition). c) To compose text with different typefaces (mixed typeface composition). multi-column format تَنْسِيقْ مُتَعَدِّدْ الأَعْمِدَة tansīq mutaʻaddid al-’aʻmidah شکل‌بندی چندستونی šklbndi čndstuni A format of text on a page where text is divided into two or more sections (columns) in the inline direction and each column is separated by a certain amount of space (column space). multivolume work عَمَلْ مُتَعَدِّدْ الأَجْزاءْ ʻamal mutaʻaddid al-’ajz’ اثر چند جلدی āsr čnd jldi A set of work published in two or more volumes, as in the complete work or the first/last half volumes. mukawwar مُكَوَّرْ mukawwar Kind of writing style, generally opposed to mabsut, that is more flexible and rounded. new column عَمُودْ جَدِيدْ ʻamūd jadīd ستون جدید stun jdid In multi-column setting, to change to new column before the end of current column. new recto صَفْحَة يُمْنَى جَدِيدَة ṣafḥah yumná jadīdah آغاز در صفحهٔ فرد āqāz dr sfhhٔ frd To start a new heading or something on a odd page. note مُلَاحَظَة mulāḥaẓah یادداشت iāddāšt Explanatory information added to terms, figures or tables. number of characters per line عَدَدْ الأَحْرُف فِي كُلِّ سَطْرْ ʻadad al-’aḥruf fī kulli saṭr تعداد حروف در خط t’dād hruf dr xt Number of characters in a line to specify the length of lines. number of columns عَدَدْ الأَعْمِدَة ʻadad al-’aʻmidah تعداد ستون‌ها t’dād stunhā Number of columns on a page. one em space مَسَافَة اِمْ وَاحِدَة masāfat im wāḥidah فاصلهٔ اِم fāslhٔ em Amount of space that is full-width size. one third em ثُلُثْ اِمْ thuluth im یک‌سوم اِم iksum em One third of the full-width size. one third em space مَسَافَة ثُلُثْ اِمْ masāfat thuluth im فاصلهٔ یک‌سوم اِم fāslhٔ yksum em Amount of space that is one third size of em space. page صَفْحَة ṣafḥah صفحه sfhh A side of a sheet of paper in a written work such as a book. page break فَاصِلْ صَفْحَة fāṣil ṣafḥah To end a page even if it is not full and to start a new page with the next paragraph, a new heading and so on. page format شَكْلْ الصَّفْحَة shakl al-ṣṣafḥah شکل‌بندی صفحه šklbndi sfhh The layout and presentation of a page with text, graphics and other elements for a publication such as a book. page number رَقْمْ الصَّفْحَة raqm al-ṣṣafḥah شمارهٔ صفحه šmārhٔ sfhh A sequential number to indicate the order of pages in a publication. paragraph فَقْرَة faqrah پاراگراف pārāɡrāf A group of sentences to be processed for line composition. A paragraph consists of one or more lines. paragraph break اِنْقِطَاعْ الفَقْرَة، كَسْرْ الفَقْرَة inqiṭāʻ al-faqrah, kasr al-faqrah شکستن پاراگراف škstn pārāɡrāf To start a new line to indicate a new paragraph. paragraph format تَنْسِيقْ الفَقْرَة tansīq al-faqrah شکل‌بندی پاراگراف šklbndi pārāɡrāf A format of a paragraph, as in line head indent or line end indent. point نُقْطَة nuqṭah نقطه nqth A measurement unit of character size. 1 point is equal to 0.3514mm (see JIS Z 8305). There is another unit to measure character sizes called Q, where 1Q is equivalent to 0.25mm. printing types أَنْوَاعْ الطِّبَاعَة anwāʻ al-ṭṭibāʻah Movable type used for letterpress printing. proportional مُتَنَاسِبٌ mutanāsibun A characteristic of a font where character advance is different per glyph. punctuation marks عَلَامَاتْ التَّرْقِيمْ ʻalāmāt al-ttarqīm A general term referring to the symbols used in text composition to help make the meaning of text clearer, as in commas, full stops, question marks, brackets, diereses and so on. quarter em رُبْعْ اِمْ rubʻ im رُبع اِم rob’ em Quarter size of full-width. quarter em space مَسَافَة رُبْعْ اِمْ masāfat rubʻ im فاصلهٔ رُبع اِم fāslhٔ rob’ em Amount of space that is a quarter of an em space in size. quarter em width عُرْضْ رُبْعْ اِمْ ʻurḍ rubʻ im پهنای رُبع اِم phnāy rob’ em Character frame which has a character advance of a quarter em. quotation اِقْتِبَاسْ iqtibās Excerps from other published works. reference marks العَلَامَاتْ المَرْجِعِيَّة al-ʻalāmāt al-marjiʻīyah A symbol or short run of text attached to a specific part of text, to which notes are provided followed by the corresponding marks. reverse pagination تَرْقِيمْ الصَّفَحَاتْ عَكْسِي tarqīm al-ṣṣafaḥāt ʻaksī Numbering pages of a book backwards. river نَهْرْ nahr Optical path of white space that sometimes occurs when word spaces in successive lines of type occur immediately below each other and continue for several lines. Roman numerals الأَرْقَامْ الرُّومَانِيَّة al-’arqām al-rrūmānīyah اعداد رومی ā’dād rumi Numerals represented by upper case or lower case of Latin letters. run in فِي نَفْسِ الخَطْ fī nafsi al-khaṭ In typography, any copy—specifically a head—designed to be set in the same line as the text. run-in heading عُنْوَانْ بِدُونِ اِنْقِطَاعْ ʻunwān bidūni inqiṭāʻ A kind of heading style to continue main text just after the heading without line break. second level heading عُنْوَانْ المُسْتَوَى الثَّانِي ʻunwān al-mustawá al-ththānī Second level and middle size heading between first level heading and third level heading. shadda شَدَّة shaddah A tashkil mark indicating gemination of the base consonant. single line alignment method طَرِيقَة المُحَاذَاة لِسَطْرٍ وَاحِدْ ṭarīqat al-muḥādhāt lisaṭrin wāḥid To align a run of text that is shorter than a given line length to designated positions. single running head method طَرِيقَة الرَأْسْ بِتَشْغِيلْ وَاحِدْ ṭarīqat al-ra’s bitashghīl wāḥid A method that puts running heads only on odd pages. space فَرَاغْ farāgh فاصله fāslh Amount of space between adjacent characters or lines. It also refers to the blank area between the edges of a hanmen or an illustration and text or other hanmen elements. spread اِنْتِشَارْ Any two facing pages when opening a book and the like. subscript (inferior) نَصْ مُنْخَفِضْ (أَسْفَلْ) naṣṣ munkhafiḍ (’asfal) Smaller face of characters, attached to the lower right or the lower left of a normal size character. subtitle عُنْوَانْ فَرْعِي ʻunwān farʻī زیرنویس zirnuys Secondary title for headings, subtile. sukun سُكُونْ sukūn A tashkil mark indicating the lack of a vowel after the consonant to which it is attached. superscript (superior) نَصْ مُرْتَفِعْ (أَعْلَى) naṣṣ murtafiʻ (’aʻlá) Smaller face of characters, attached to the upper right or the upper left of a normal size character. tab setting وَضْعْ عَلَامَة التَّبْوِيبْ waḍʻ ʻalāmat al-ttabwīb A method of line composition to align one or more runs of text to designated positions on a line. table جَدْوَلْ jadwal جدول jdul Formatted data consisting of characters or numbers, arranged in cells and sometimes divided by lines, in order to present the data in a way that is easier to understand. table of contents جَدْوَلْ المُحْتَوَيَاتْ، الفِهْرِسْ jadwal al-muḥtawayāt, al-fihris فهرست مطالب fhrst mtālb A list of headings of contents of a book in page order or arranged by subjects, with page numbers on which each section begins. tanwin تَنْوِينْ tanwīn (Derived from Noon). Tashkil marks indicating postnasalized or long vowels at the end of a word, and indicated by doubling the sign of one of the harakat diacritics. tashkil تَشْكِيلْ tashkīl Marks that are added to letters to indicate vocalisation of text or to correct pronunciation. In Unicode these are all combining characters applied to a base character. text direction اِتِّجَاهْ النَّصْ ittijāh al-nnaṣ جهت متن jht mtn Horizontal setting or vertical setting. third level heading عُنْوَانْ المُسْتَوَى الثَّالِثْ ʻunwān al-mustawá al-ththālith Headings for smallest or minimum unit of main text in books. top level heading عُنْوَانْ المُسْتَوَى الأَعْلَى ʻunwān al-mustawá al-’aʻlá Headings for largest or muximum unit of main text in books. trim size حَجْمْ التَّقْلِيمْ، حَجْمْ القَصْ ḥajm al-ttaqlīm, ḥajm al-qaṣṣi Dimensions of a full page in a publication, including margins. type styles أنماط الكتابة The measure of the height of the characters of a font, measured in points. typeface مِحْرَفْ miḥraf فونت، قلم funt, qlm A set of letters or symbols, which are designed to have coherent patterns to be used for printing or rendering to a computer screen. unbreakable characters rule قَاعِدَة أَحْرُفْ غَيْرْ قَابِلَة لِلْكسْرْ qāʻidat aḥruf ghayr qābilah lilksr A line breaking rule that prohibits breaking a line between consecutive dashes or leaders, or between other specific combinations of characters. underline تَسْطِيرْ مِنْ تَحْتْ tasṭīr min taḥt A line drawn under a character or a run of text in horizontal writing mode. 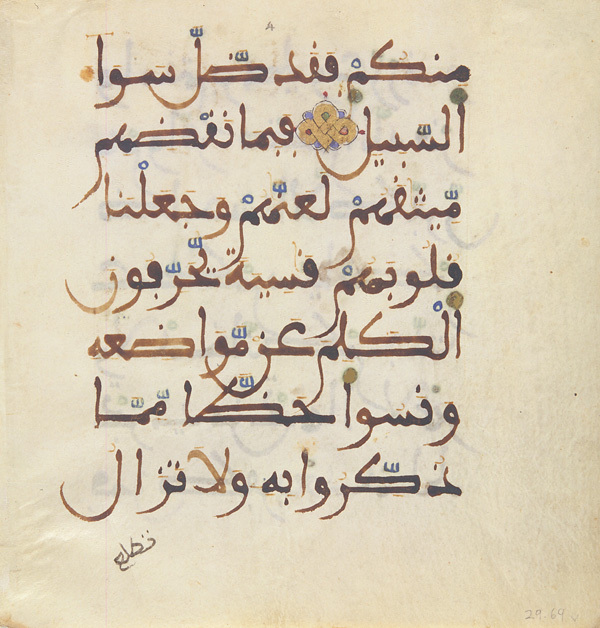 vertical writing mode وَضْعْ الكِتَابَة العَمُودِي waḍʻ al-kitābah al-ʻamūdī حالت نوشتار عمودی hālt nuštār amudi The process or the result of arranging characters on a line from top to bottom, of lines on a page from right to left, and/or of columns on a page from top to bottom. weight ثِقَلْ thiqal A measurement of the thickness of fonts. widow أَرْمَلَة armalah The term in Western text layout to describe that the last line of a paragraph with only a few words appears at the top of a new page or a column. widow adjustment تَعْدِيلْ أَرْمَلَة taʻdīl armalah A method of line composition to adjust lines in a paragraph so that the last line consists of more than a given number of characters.